Bruce Sterling -- who will speak at our University tonight -- received the above picture from William Gibson -- the man who invented the word 'cyberspace' -- and posted it at his weblog: " Wow, a custom-detailed, one of a kind, post-consumer-altered MP5!" Nitpick: a Heckler&Koch MP5k. Ain't that a fine example of aesthetic technology adaption? 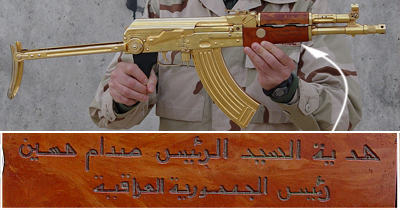 Envision an exhibition in an ethnological museum, showing weapons like the above one -- and of course the gold-plated AK-47s from Iraq's ex-elite. And now envision the size and kind of crowd that would flock into an exhibition like that ;-) Seriously: Those indeed are examples of the acculturation, or even cultural appropriation, of industrial artefacts by modifying them; and therfore an issue of sociocultural anthropology. Both, choice of the weapons, and the kind of modification are culturally informed. 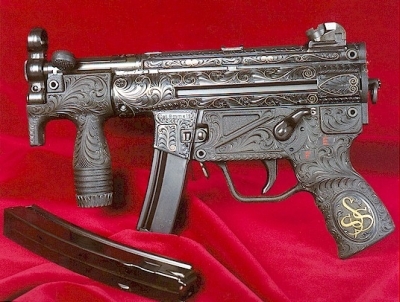 Decoration of weapons with ornaments is nothing special per se -- it is done especially with hand guns like pistols and revolvers or hunting rifles. The two examples in the pictures are peculiar, because we deal here with fully automatic weaponry, which is designed for combat, and combat only -- that's the context of weapons like that. Whenever I hear the name B.S., I have to think of either Batman whose real name is Bruce something or Clarice Starling ("Silence of the lambs"). Why am I not astonished at all that B.S. and the famous action actor William Gibson, known from movies such as "Braveheart" and "Mad Max", are interested in weapons?